Exhibits & Trails: Be sure to wear comfortable walking shoes and bring plenty of water. The Desert Gardens have many unpaved paths and water fountains are located at various points throughout the garden for visitors to stay hydrated. Ottosen Entry Garden: This Garden was opened in November of 2009 and serves as the Garden’s grand lobby. Four small gardens make up the Entry Garden: the entry, terrace, basin, and canal, and they feature dramatic displays of succulents and cacti, carefully planned to showcase the diversity and the beauty of desert plants. 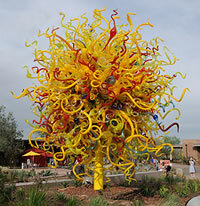 The Ottosen Garden introduces visitors to the Desert Gardens, and sets the stage for their desert garden experience. Desert Discovery Trail: This is the main trail of the Desert Botanical Gardens. Along this trail visitors can learn about the many fascinating characteristics the desert plants of the world have to offer. They can explore the wondrous diversity of color, form, and texture of an array of cacti and succulents located around the world. The Desert Discovery Loop Trail is approximately 1/3 of a mile long. People & Plants of the Sonoran Desert: The Sonoran Desert Trail is one of the largest exhibits of its kind. The National Endowment for the Humanities funded this loop trail in 1989. This exhibit is dedicated to furthering the world’s understanding of the complex relationship between plants and people. This trail winds its way through five different habitats of the Desert Gardens. These recreated habitats have provided mankind with plants that have been used for food and medicine for over 2,000 years. The five habitats are Mesquite Bosque, Desert, Chaparral, Desert Grassland, and Desert Oasis. The story describes life through cultural examples of Western Apache, Hispanic, and Tonoho O’odham households which visitors can actively explore. This loop trail is closed after sunset. The trail is roughly 1/3 mile long. Sonoran Desert Trail: This loop trail of the Desert Botanical Gardens features amazing vistas of the distant mountains, as well as closer views of the desert that surrounds the Garden. The exhibit focuses on the fascinating animals and plant life that exist in the desert, such as the incredible pipe organ cactus. This trail also is closed at sunset. From start to finish this trail is about one quarter of one mile long. Steele Herb Garden: The Herb Garden showcases a wide variety of herbs that have adapted themselves to a desert environment. Several smaller gardens make up the Herb Garden, a Picante Garden, Wildlife Garden, Sensory Garden, Tea Garden, and Medicinal Garden. The Herb Garden is open until sunset. Harriet K Maxwell Desert Wildflower Loop Trail: This wildflower exhibit is planted on roughly two acres of land and showcases year round displays of North American desert plant life. Even though wildflowers bloom all year long in this region, the bloom is unpredictable and it is subject to the combination of temperature and rainfall. The peak bloom season for the Wildflower Loop Trail is at the beginning of spring during March and April. Sybil B Harrington Cactus & Succulent Galleries: These galleries are located as part of the Desert Loop Trail. 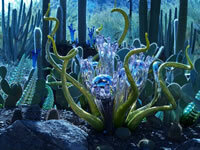 Visitors will experience a complete evolutionary chain and story about desert cacti and succulents. Showcasing a wide variety of cactus families, the cactus gallery includes plants from Central and North American deserts, including coastal and high elevation regions. In the succulent gallery you will find exotic plant life from all over the world. These two galleries combine to give visitors to the Desert Gardens a fantastic sculptural display of the wide variety of desert plants that inhabit our world. 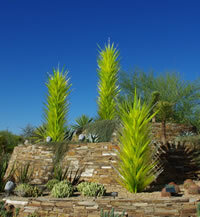 Yucca Forest: This dramatic forest exhibits an amazing display of plants from the nolina, yucca, and agave families. Accessed by a connecting bridge along the Desert Loop Trail, visitors first see the observation point known as Joy’s Overlook. From here you will witness a dramatic view of the Desert Botanical Gardens from a natural wash that overlooks the Garden Butte and yucca forest. Las Noches de las Luminarias: For 33 years the Desert Gardens has been celebrating this unique holiday event. The entire Garden is brought to life each night of the Luminaria by over 8,000 luminaria bags. Visitors can walk the many garden paths that are lined by these hand lit bags, while listening to holiday carolers and sipping warm cups of apple cider. Bring your friends and family and be reminded of what the holiday season is supposed to be about. Remember to order your tickets however because space is limited during this popular event and tickets will sell out fast. Children's Programs: The Desert Botanical Gardens wants to give your children an unforgettable experience by offering them a connection with nature. The Garden has programs for all ages from preschool to teens, as well as family programs that will get everyone involved. They offer a hands on summer camp for children of any age, along with a program for Girl Scouts. The Garden is also offering a treasure hunting quest where the entire family can explore the garden while following a treasure map with special clues. During the “hunt” your children will learn about map reading and desert ecology, all while having fun.